As it happens, the history of knitting is somewhat obscure – artifacts have been discovered as far back as 1000 AD, but because of the fragile nature of textiles, it’s likely that the craft is older than that. Interesting speculation suggests that it evolved from the Middle East, where language is read from right to left, because knitting is from right to left. Full marks for creativity. A little worried about the lady’s social life. I love the video. Here is your Friday Whimsy. This took considerable time and a fair bit of imagination. Kudos to the artists Jill and Lorna Watt. Click on the image to go to the original blog post. Check out the intriguing set of photos on Peta Pixal. What can you capture in a single second? Check out this 72-second video to find out the amazing wonder you can see in just one second. PS – Happy 93rd Birthday, Grandma! The Knitterati is a group of Atlanta knitters that adorn the fair Peach City with lovely and whimsical textile treasurers. I would contemplate a vacation to that fair city for the sole purpose of seeking out such unexpected delights. 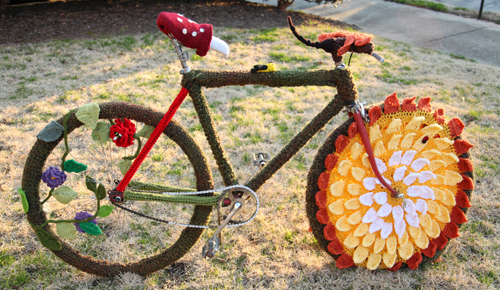 Yarn bombing is becoming popular form of textile instillation art. This trend not only lifts knitting as an art form in its own right (and not “merely” a craft), it also provides the public with something interesting, eye-catching, colorful, and thought-provoking in unlikely but readily-accessible locations. The Knitterati group installed an ambitious bridge project in Atlanta. Click the picture below or the link to see more of their adventurous installations.